As India celebrated its 67th Independence Day Thursday, NRIs across the globe marked the special day away from their motherland with festive fervour. Federation of Indian Community of Southern California (FICSC) organized the 67th Independence Day Celebrations at Excelsior High School, Norwalk, CA on August 17, 2013. The function started with singing of National Anthems of India and the U.S.
Ravinder Verma, the vice president of FICSC invited the chief guests and members of FICSC on stage, including chairman Dilip Butani; the president Amrit Bhandari; executive-president Sam Bhoga; executive-v.president Mohan Sharma; treasurer Ramesh Ramnani along with members Raj Walia, Balwinder Garcha, Ajay Khetani, Babubhai Patel and Kris Kakkar. Prominent among those who attended the celebrations were, Sally Flowers, Mayor of Artesia, Dr Parkash Narayan, Mayor of Cypress, KV Kumar, Harry Sidhu, Member Orange County Water Board. Mr Sidhu read a Procalamation on behalf of OC Water Board and also used the platform to annonce his race for California State Assembly. Dilip Butani and Bhandari were honored by the mayors with certificates of excellence for outstanding service to the NRI community. 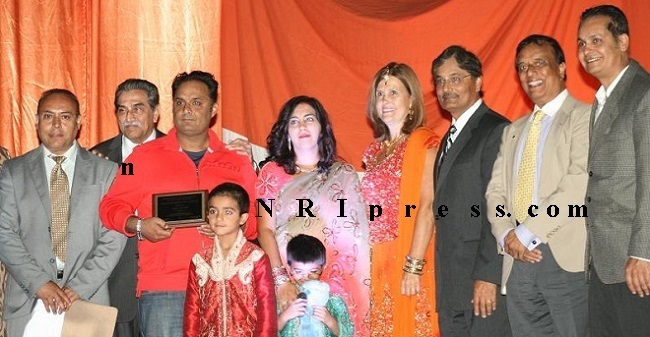 Sunil Tolani was one of the platinum Sponsors and was also awarded with a certificate of excellence for his humanitarian spirit and philanthropic work to the NRI community. " The corporate & Social responsibility and charitable giving should be in the DNA of every organization, " said Tolani." Our processes are aligned so as to benefit the society and the community." He thanked for award and said: You are the true heroes of the community who have sacrificed months after months , weekends after weekends and made this program possible. Sam Bhogal emceed the program and kept the audience regaled with his jokes and fun anecdotes. To start with there were dance performances by various young children and other dance groups and individuals. "Aye Mere Watan Ke Logon," the famous song was sung by Bhavna Chawla, the most popular singer in LA area. The fashion designer Shekhar Rahate's show included Hollywood and Indian models with his line of evening gowns. The biggest attraction of the evening was WWF wrestler and Hollywood actor, The Great Khali. As soon as he came on the stage, the audience went into a great applause to welcome their idol. He gave a short speech about importance of the Indian Indepenence and asked his coutrymen to live in peace and love each other. He happily obliged with autographs and getting photographed with his fans.The Great Khali visited the various booths by a ride of convertible BMW. The crowds could be seen enjoying the cultural program as well savoring various dishes at the food booths. It was a well organized function which was attended by about 700-1000 people.